Unique Rock Landscaping. Ideas That Won't Look Identical to Your Neighbors. In the minds of most people, recycling is typically limited to paper, plastic, and aluminum. At MDI Rock, we have taken things one step further and implemented an innovative Green Initiative focused on recycling green waste that is dropped off at our Phoenix and Queen Creek locations. Our new program turns this waste into a nutrient-rich compost that is available for pickup at either Valley location. Yard materials account for nearly 20 percent of all garbage generated each year (according to the University of Illinois Extension citing the US Environmental Protection Agency). That makes our composting service even more vital! By giving us your yard debris and using the resulting compost, you can be a part of the “Green Revolution” aimed at reducing Arizona’s trash and waste. How Does Recycling Green Waste Work at MDI Rock? Our goal is to enable local landscape companies and individuals to have a place to dispose of green yard waste in Phoenix and Queen Creek for a reasonable fee. The disposed green yard waste that is collected is then transported by MDI Rockto our Dewey site for processing (a trip we already make to pick up our rock material, so the travel involved consumes no additional diesel fuel than normally used). The transferred green waste is next ground up by a machine akin to a hugely powerful lawn chipper, and then placed in typical piles to compost. After months of composting, it is then processed through a screening machine to sift out all undesirable matter (e.g.,sticks and root clumps) – leaving a rich, dark compost ready for use. 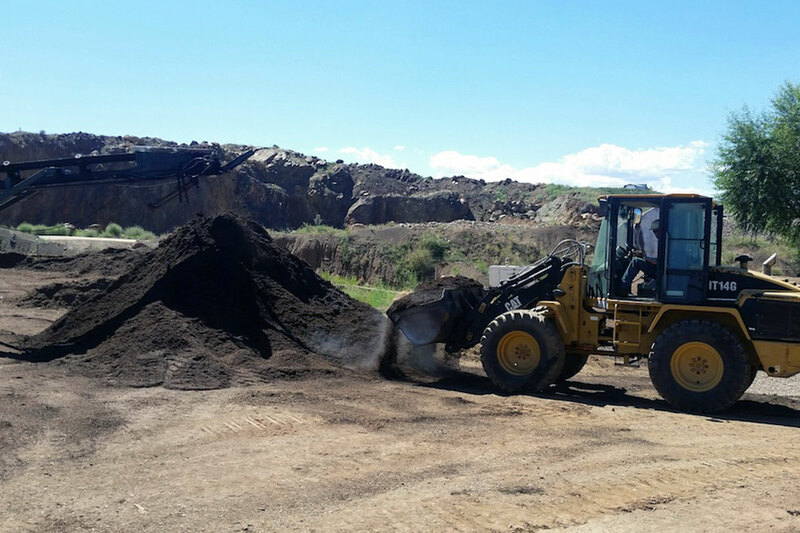 Not only is our compost high-quality, it may be better than what can be produced in your own backyard or community. We have had our finished product tested by an independent laboratory, and it has been verified as a nutrient-rich compost. Combined with utilizing our diverse selection of landscape rock and materials, our compost can aid you in creating a garden that maximizes the best feature of your home or commercial property. Our recycled compost is now available for customer pickup at all three locations. If you are interested in participating in our yard waste recycling program by dropping off your green waste, please contact our Phoenix or Queen Creek locations for disposal fees and more information. To maintain a quality product, we do not accept waste containing cactus, palm leaves, full trees, or oleander. If you need supplies for your landscaping project, give us a call. At MDI Rock, we supply a wide range of products for all sorts of uses at competitive prices. In addition to our many choices in decorative groundcovers, we provide rip rap, flagstone, topsoil, sand, gravel, and a huge selection of boulders. Call us at 602-569-8722 or contact us online. We deliver anywhere from across the street to across the country!